Two MMA giants with UFC titles and amateur wrestling backgrounds in their career resumes may get to meet each other in the Octagon for an actual fight, according to UFC President Dana White. White said a bout between current UFC heavyweight champ Daniel Cormier and former UFC champ (and current WWE Universal Champ) Brock Lesnar is very much a possibility after UFC 232 this past weekend. “No, (Lesnar is) not out of the picture,” White said at the post-event news conference at The Forum in Inglewood, Calif., site of UFC 232. “Absolutely (he could still fight Cormier). I think he’s already under contract with me. We were talking about it, and then he ended up signing a new deal with WWE. That said, White has no plans to wait for Lesnar to take his time making a decision as to a possible return to the Octagon. Why is the president of UFC bringing this up now? 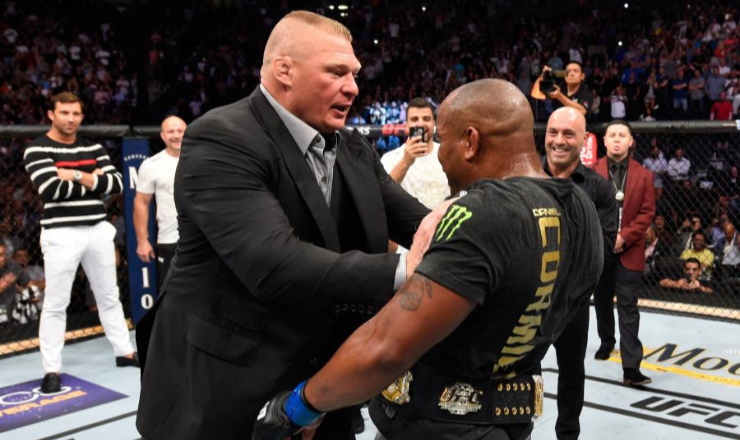 The idea of a Cormier-Lesnar UFC bout can trace its roots back to this past July at UFC 226. Lesnar entered the Octagon after Cormier had defeated Stipe Miocic to win the UFC heavyweight Title, shoving the newly-crowned champ… and setting up buzz among MMA fans of a possible grudge match. Until this past weekend, Cormier had held both the UFC heavyweight (265 pounds) and UFC light-heavyweight (205 pounds) titles. On Saturday, Cormier ceased to be a two-division champion when Jon Jones won back the light heavyweight title with a TKO of Alexander Gustafsson in the UFC 232 main event. That quickly set up talk of a third fight between Cormier and Jones, his arch rival… with UFC’s White saying, in essence, don’t shut the door on a Cormier-Lesnar UFC bout. Both Cormier and Lesnar would bring strong amateur wrestling credentials to a UFC fight. Cormier, 39, was a three-time Louisiana high school state wrestling champ who then became a two-time 197-pound NJCAA (National Junior College Athletic Association) champ for Colby Community College in Kansas. Cormier then transferred to Oklahoma State where he made it to the 184-pound finals at the 2001 NCAA Division I championships, losing to current Penn State head coach Cael Sanderson, 8-4. Cormier was also twice a member of the U.S. Olympic men’s freestyle team, placing fourth at the 2004 Athens Olympics, but was unable to compete at the 2008 Beijing Games due to kidney failure. The 41-year-old Lesnar started his mat career at Webster High in South Dakota, placing third at the state championships. He headed north to Bismarck State College in North Dakota, where he won the heavyweight title at the 1998 NJCAA championships. The 6’3″, 265-pound collegian caught the eye of J Robinson, then head coach at University of Minnesota. In two years as a Gopher, Lesnar was twice a Big Ten heavyweight champ and two-time NCAA finalist, winning the title at the 2000 NCAAs.